Rio Olympics Bronze winning captain Mikel Obi, Man City star Kelechi Iheanacho and Arsenal starlet Alex Iwobi were not nominated as BBC announced its shortlist for its African player of the year award with players Pierre-Emerick Aubameyang, Andre Ayew, Riyad Mahrez, Sadio Mane and Yaya Toure making up the five-man shortlist. Borussia Dortmund and Gabon striker Aubameyang is on the shortlist for the fourth consecutive year, Leicester city and Algeria forward Riyad Mahrez has been rewarded for his stellar year with Leicester while Manchester City's Ivorian midfielder Yaya Toure also appears on the list. The other two players nominated are West Ham/Ghana attacking midfielder Andre Ayew who has won the award in 2011 and Liverpool/ Senegal player Saido Mane. The nomination list was announced during a live broadcast at BBC's headquarters in London on Saturday evening. 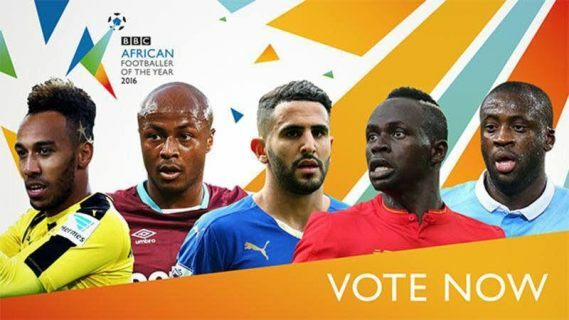 The winner of the 2016 BBC African footballer of the year award will be announced on Monday, 12 December and will be decided by fans who can vote from now till 18th November.